In 2012 my family left Applecross to start a new life in Devon. The remote West Coast peninsula is a hard place to leave both in a logistical and spiritual sense, but we have returned every year since on holiday. The community and elemental landscape continue to exert a strong emotional pull. With our two children reunited with their old play mates and attending the primary school for the week, and Carolyn out visiting, I had a morning to roam. A chance meeting with old friend Gerry McPartlin resulted in me accepting an invitation to accompany him on a run that would take in the glen and some of the local mountains that rise above. This was a perfect opportunity to re-familiarise myself with my former home and also to catch up on the last 12 months of Applecross life. Runners are rarely silent as the stride. As an afterthought Gerry added ‘I’m planning to run about 15 miles and take in 5,000 ft of ascent; you’ll be fine with that I’m sure, a young man like you‘. Even in his 70s Gerry displays an unusual desire to test the limits of his body and mind. The last few years have seen him complete the London Marathon and scale all of the 283 3,000ft Munros in 88 days. His eyes were now set on completing the Great Wilderness Challenge, an arduous 25 mile mountain marathon. Our run was to form part of his early preparations. There is invariably a twinkle in his eye when Gerry suggests an outing; often what he proposes has the makings of an epic, and with every invitation is a kindly coded challenge. Like most young men (an energetic 47!) I wasn’t going to back down having accepted, even though the distance was longer than I was comfortable with, and two years of living in Devon had softened my mountain legs. 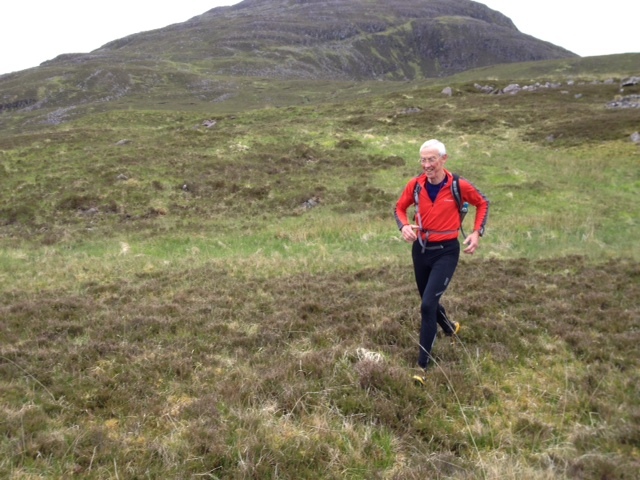 My last run with Gerry had been two years previously, a failed attempt to complete the Trotternish Ridge Race on Skye, a fairly brutal 26km race undertaken on the day in white out conditions and a howling gale. I was hoping for something more sedate this time. I have always been an enthusiastic amateur runner. I was never that gifted at sports as a child, and being tall and lanky have a physique that seems naturally suited, if not to explosive speed, then at least to consuming miles. Distance running is one of only a few things in life I find easy. Although I have completed the occasional hill race, half marathon and even marathon, I’ve never been that driven to compete and am not that interested in improving on a ‘personal best’ for a set distance. I also don’t have the mental discipline to undertake constant training and invariably find it hard to pull on my trainers; more so as I get older. But once the decision has been made to set out, I have found constant solace and contentment throughout my adult life in exploring landscapes by foot at a regular jogging pace. The combination of soaking up the landscape, rhythmic breathing and observing the changing fabric of the countryside as it passes, invariably results in me being in a better mental place than when I started. More optimistic somehow; more sure of myself; invigorated; more content with my place in a world I have yet to understand. For me running is a reversion to a most basic state with the body and mind exploring and gaining energy from the power of the land through which it passes. Anything up to 12 miles is my natural distance. On a good week where work, family commitments and energy levels allow, I maybe run 20 miles. Two runs of 5 miles mid week with a longer route of perhaps 10 at the weekend being typical. Prior to Gerry’s invitation though, I had been largely idle for two months waiting for a muscle strain to heal. We met at Hartfield in the glen at 8am, and began running along the solid and ancient coffin route between Clachan Burial Ground and Kenmore. We were joined by Greg Watson, another of the peninsula’s mountain-loving characters and like Gerry, a stalwart of the nearby Torridon Mountain Rescue team. The weather was grey and mild and a light breeze kept the midges in the undergrowth. After a few hundred metres we crossed south-eastwards over the River Crossan to ascend a small hill north of Allt Mort, a stream with ancient woodland remnants flanking its sides. This was a place I once loved coming with the family for a picnic. On reaching its summit we descended by the same route and then headed up the glen, wary of the Highland cattle and their young idly browsing close to the path. Although passive creatures, their horns and maternal desire to protect their young demand respect. By now we had each found our rhythm, our even pace allowing punctuated conversation. This ranged, as it invariably seems to in the Highlands, from an update on who had found work, deer, crofting politics, sheep, the local Inn, the outcome of the 2014 referendum, the rise of the SNP and the potential implications of the Scottish Land Reform Bill for Applecross. A change from when I had lived here two years previously was the arrival of Tesco delivery vans. Although embraced by many, others still shun this new arrival which they fear may threaten the existence of the local shop and post office. After 20 minutes we left the main track and ascended the rough terrain of the slopes of Beinn a’ Chlachain. The only flowers to shine out through the heather and deer grass were milkwort and lousewort. By all accounts it had been a hard spring and worse early summer. Their tiny blooms of intense blue and pink were a welcome presence. As we climbed higher, our increasingly punctuated chat covered the re-introduction of beavers, forestation and re-wilding, but eventually the gradient became such that each of us retreated into our own heads a little more. The conversation had internalised. What do I think about on long runs? Everything and nothing, and what is certain is that I cannot focus. Instead, a constant miscellany of unconnected concerns, desires and memories pass through my mind, not in a rush, but as a stream of fair weather cumulus clouds drift across the sky. All moving sedately, none of them ever really tangible for more than a second or two before disappearing to be replaced by another. Running is not great for bringing clarity to a problem I may have. Yet somehow the process results in me feeling that I somehow ‘know’ a little bit more about myself than I did before. Peaking at around 600m, no paths now guiding our route, we ran northwards. Conversation by this time had all but been abandoned. Although our feet trod the same ancient rocks, our minds were inhabiting different mental landscapes. After a few more minutes the darkness of An Dubh-loch appeared in a valley below and we each chose our own desire lines down the slope to reach its south-eastern shore. There is something immensely satisfying about reading a landscape and selecting the most effortless route through it. I chose the vivid green that traced a small stream, judging it to be a soft mat of Sphagnum; damp enough to soften the heel strike, but firm enough to hold the weight. I am not always the best at route choices, but on this occasion it was ideal, and I effortlessly glided to the dark loch’s shore. On a different day a swim in this remote water, a dark eye at the base of an immense barren amphitheatre, would have been impossible to resist, but we still had many miles to cover. An adventure for another time. From the loch edge we curved south-eastwards, still picking our way across sandstone bedrock and moor. At this point Greg, as if catching sight of a something precious that we couldn’t see increased the pace and traversed out of sight behind a crag. ‘Let’s leave him be, he’ll find us later,’ said Gerry. ‘We should descend here‘. We had been running for about two hours at this point. Still no fatigue but my top was drenched with sweat and my socks darkened by peaty water. The descent back to the main glen was not arduous, but this time there was no easy carpeted route to follow and both of us ended up doing the classic zig-zag descent of mountaineers. Awkward and slow. Finally, as we passed some long abandoned sheilings, the sound of cuckoos and the energetic tumbling waters of the River Crossan welcomed us towards the valley floor. Seven miles covered. I judged that to return back to the cottage where we were staying was a further five miles, and in case I didn’t have a chance later in the week, I also wanted to take in the network of inter-connecting paths in the lower glen that were familiar to me, and which I had greatly missed since moving south. That would make 12 miles and more than enough. We said our brief goodbyes and agreed to meet for a drink later in the week. Gerry turned away and began the slow climb below Meall Arachaidh to meet Greg who was somewhere above us, whilst I took the easier route and headed downhill, the limpid waters of the Sound below framed against tilted slopes of sandstone and the Isle of Raasay beyond. A few languid creelers seemed motionless on the water. I breathed in the view. After two and a half hours I began to extend the stride, assisted by gravity, and I reached that magical place which all runners will recognise, where you feel you can run forever and one’s love for living is unconstrained. Thanks to Gerry and Greg for reminding me of the harsh beauty of the Applecross landscape and for re-kindling my love for wilderness running.